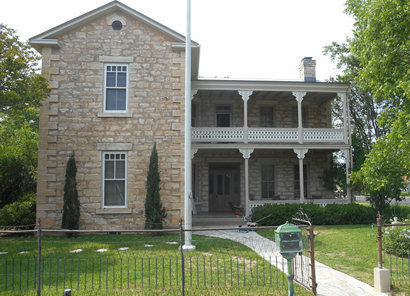 Alfred Giles was an English architect and an unlikely Texan, but he had a profound influence on building design in San Antonio and helped define the architectural style best associated with the Texas Hill Country. 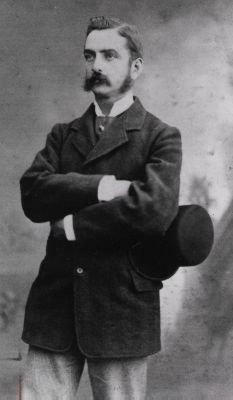 Giles was born in London in 1850. He studied architecture at King's College but left England for a healthier climate after a bout with rheumatic fever. The damp London air was bad for his health. So in 1873 Giles came to Texas. He set up shop in downtown San Antonio, at 114 West Houston Street. Over the next four decades he designed between 90 and 100 of the most beautiful buildings in South Texas and northern Mexico. He designed county courthouses for Bexar, Brooks, El Paso, Gillespie, Guadalupe, Kendall, Kerr, Kimble, Live Oak, Webb, and Wilson Counties. He drew the plans for several homes in the historic King William District in San Antonio and the 1909 addition to the Menger Hotel next door to the Alamo. Giles left his mark all over the Texas Hill Country - a place he came to love. 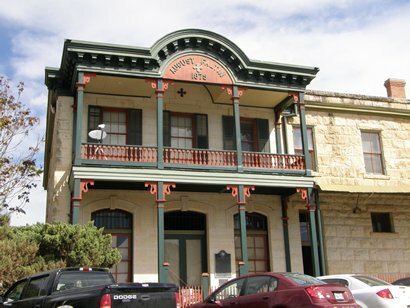 In Fredericksburg he designed the Gillespie County Courthouse (now the Pioneer Memorial Library), the William Bierschwale House at 110 N. Bowie Street, and the Bank of Fredericksburg on Main Street (now Kowert Real Estate). He built the Morris Ranch School House. 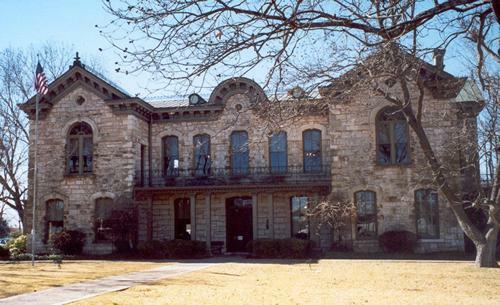 In Kerrville, Giles designed the Charles Schreiner Mansion, the A. C. Schreiner Jr residence, the Schreiner Store, and the Schreiner Bank. 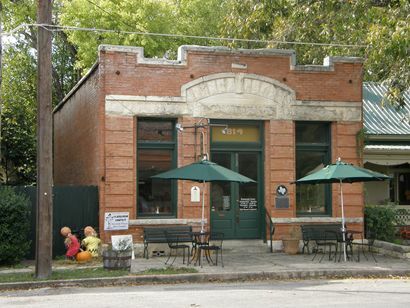 In Comfort Giles designed the August Faltin Building, the Old Comfort Post Office, the Ingenhuett-Faust Hotel, the Ingenhuett-Karger Saloon, and the Paul Ingenhuett residence. His buildings are timeless, and yet they reflect the time and place in which they were built. His style was Victorian with Spanish and German influences. His Hill Country residences, with native limestone walls, large windows, narrow breezy rooms, deep porches, and rustic ironworks are a pitch perfect reflection of 19th century Texas Hill Country culture. His public buildings express strength, trust, and permanence. Giles had a deep respect for the Alamo defenders and designed a 163 foot high monument to honor them. Mrs. Maury Maverick and most city leaders in San Antonio supported the Giles monument, but the selection committee chose instead the Cenotaph (empty tomb), designed by Pompeo Coppini. Backers of the Giles' design were not kind to the Cenotaph. J. Frank Dobie said the Coppini monument, the one that now stands in Alamo Plaza, looked like "a grain silo." 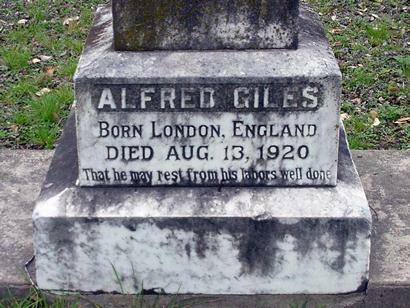 Alfred Giles returned to London in 1885, but in less than a year he was back in Texas. His time away from the Lone Star State made him realize that he had become a Texan through and through. He missed the Hill Country and couldn't wait to get back to it. He bought a 13,000 acre cattle and sheep ranch near Comfort. He called it Hillingdon after his birthplace in England. He lived at the ranch and was active in the daily operations. He was a member of the Texas Cattle Raiser's Association and a founding member of the Texas Sheep and Goat Raiser's Association. 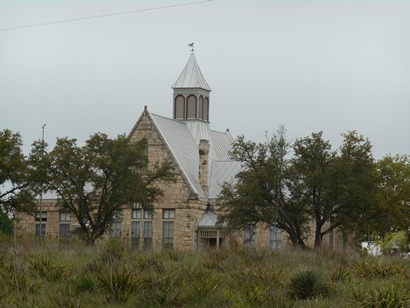 When Giles traveled from Hillingdon to San Antonio he rode a horse or a carriage to Comfort, the Guadalupe Stage Line to Boerne, and the San Antonio and Aransas Pass Railroad to San Antonio. He carried two homing pigeons with him. He released one to let his wife know he had arrived safely in San Antonio and the other to announce his plans for return. 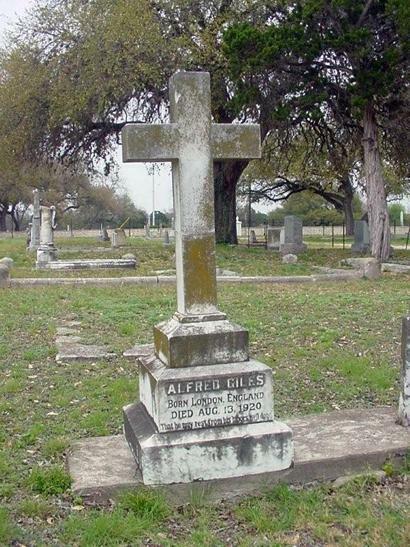 Alfred Giles died at Hillingdon Ranch on August 13, 1920. He is buried beside his wife in San Antonio City Cemetery. He made our world more beautiful. The Handbook of Texas, Alfred Giles. The San Antonio Daily Express, April 22, 1899, p4. Kerrville Daily Times, December 1, 1991, p10, "Giles' Designs Dot Hill Country." "It was a beautiful moonlit night when the stage reached the Gillespie County line. Giles, the only passenger, rode on top with the driver.